Project Area Map. Click for detail. 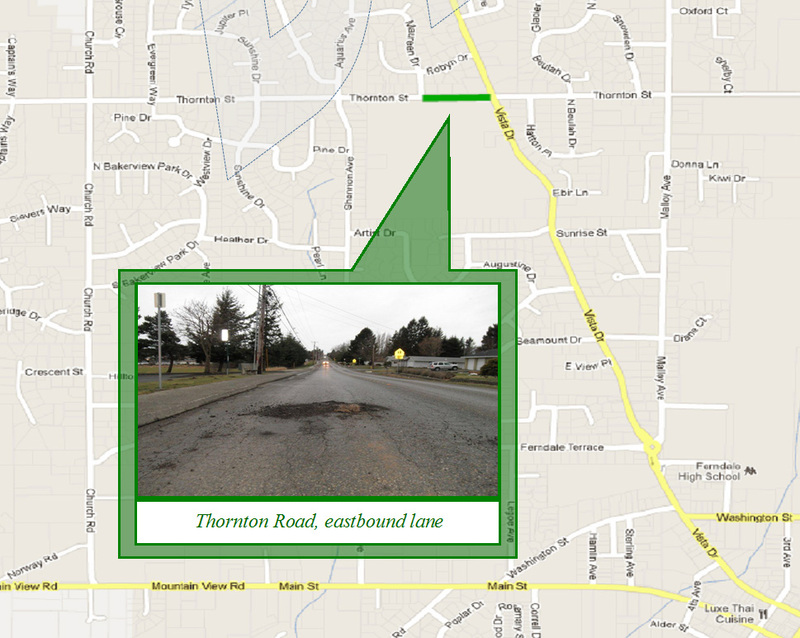 Constructed more than 50 years ago as a rural county road, Thornton Street from Vista Drive to 300 feet west of Maureen Drive is substandard in width, has no shoulders or sidewalk on the north side of the roadway and the existing sidewalk is not ADA compliant. Major freeze/thaw damage in 2011 resulted in a temporary patch of the roadway. This project includes reconstruction of 1,000 feet of roadway, new sidewalks, a bus pullout and a right turn lane on to Vista Drive. Constructed is slated to begin June 2013. Thornton Street will be closed to through traffic in the construction area during the project. Motorists traveling to or from a residence within the closure area will be permitted. The project is possible because of $100,000 to $150,000 in funding from the voter-approved Ferndale Transportation Benefit District and an $850,000 grant from the U.S. Department of Transportation’s Highway Surface Transportation Program. City water and sewer utility funds will cover costs associated with utility improvements and repairs below the roadway. The Ferndale School District dedicated property to the City for construction of the new stormwater facility planned as part of the project. Information will be posted about the project as it becomes available.